Tattoo Guide ~ Harley Quinn. 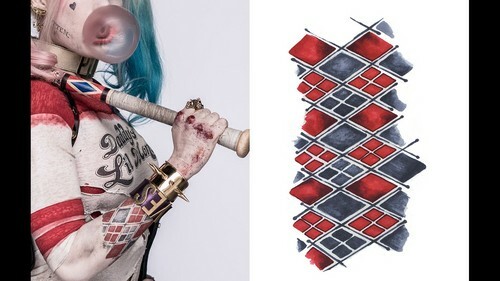 VUDU's exclusive Harley Quinn Tattoo Guide details Harley's tatoos in 'Suicide Squad'.. HD Wallpaper and background images in the Harley Quinn club tagged: suicide squad 2016 movie film harley quinn dr harleen quinzel margot robbie tattoo tattoos tattoo guide vudu photo. This Harley Quinn photo might contain recinzione a rete and recinzione in rete.